High Rise and Fall tells the story of how the European commercial property industry transformed from a local, small-scale business to an international, financially sophisticated, multi-billion-euro industry that was ultimately devastated by the 2008 crash. 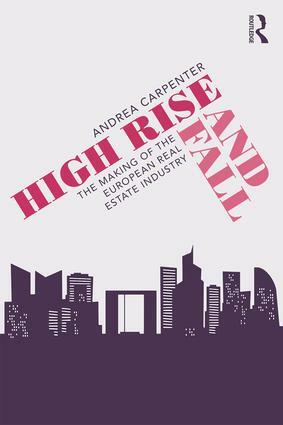 Drawing on her experience as both former Editor of EuroProperty and Director at the European Association for Investors in Non-Listed Real Estate Vehicles (INREV), Andrea Carpenter explains how the mid-1990s saw the arrival of a new style of property investing in the European markets. Seeking high returns, impervious to risk and with a seeming indifference to the buildings at the heart of the deals, US players such as Morgan Stanley, Goldman Sachs and Lehman Brothers conquered the European property markets with an audacity that both repulsed and intoxicated the locals. Fuelled by improving economic conditions in the early 2000s, European investors were keen to emulate all or parts of the US investors’ philosophy. Armed with a wall of capital, the industry expanded into the far reaches of Europe in search of returns, and piled on new risks that it did not completely understand. In her highly readable style, Carpenter analyses the mistakes made by the industry in the run-up to the crash when billions were wiped off the value of property across the region, and it became clear that in the pursuit of high returns and a place in the wider financial world, the industry had turned its back on the basics – bricks and mortar. This book is aimed at students and younger professionals studying or working in the real estate industry who need to understand the events that shaped the world they are entering into, and the lessons that can be learned from them.